The George Washington University Law School enjoyed a front row seat to the action this year as the 2008 presidential race took the world by storm. GW Law alumni, students, and faculty members served in wide-ranging capacities throughout the historic presidential campaign, transition, and inauguration. Many now hold prominent positions in President Barack Obama’s administration, while others head up national agencies and commissions. A case in point is Eric Holder Jr., the nation’s new attorney general, who received an honorary doctor of laws degree from GW Law School in 1998 and served as a GW trustee from 1996-97. Holder’s installation ceremony was held in March before a capacity crowd at GW’s Lisner Auditorium. Other Law School alumni serving in key positions include Mary DeRosa, JD ’84, deputy counsel to the president for National Security Affairs and legal adviser to the National Security Council; William A. Gunn, LLM ’74, general counsel for the Department of Veterans Affairs; Stephen G. Burns, JD ’78, general counsel of the Nuclear Regulatory Commission; and Kenneth E. Melson, JD ’73, acting director of the Bureau of Alcohol, Tobacco, Firearms and Explosives. Professor Spencer Overton, a leading election law scholar who was involved in the Obama campaign, was named the principal deputy assistant attorney general for the Office of Legal Policy in the U.S. Department of Justice. As the Obama administration neared its 100th day in office this spring, GW Law School Magazine checked in with three high-profile alumni as they completed the first months of their appointments in the new administration. Amid the worst global financial crisis since the Great Depression, anxious investors applauded President Barack Obama’s January appointment of veteran regulator Mary L. Schapiro, JD ’80, as chairman of the U.S. Securities and Exchange Commission. A proven leader with the skills and experience to meet the daunting challenges of these tough economic times, Schapiro is the first woman to chair the commission. She returns to the agency after a 15-year hiatus, previously serving as a commissioner from 1988 to 1994 under Presidents Ronald Reagan, George H.W. Bush, and Bill Clinton. No stranger to the hot seat, Schapiro chaired the Commodity Futures Trading Commission in the mid-1990s following the collapse of Barings Bank and oversaw the National Association of Security Dealers’ 2005 probe into extensive gift giving on Wall Street. 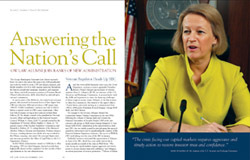 During Schapiro’s 11-year tenure with NASD, culminating in her appointment as chair and CEO, she was widely praised for strengthening the agency’s regulatory enforcement and for spearheading the creation of the Financial Industry Regulatory Authority. 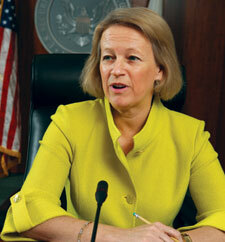 She served as FINRA’s CEO until taking over the reins of the SEC in January. 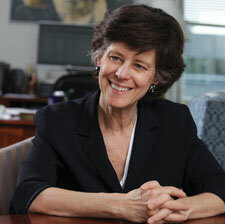 A career in regulation was nowhere on Schapiro’s radar screen when she entered GW Law. “I majored in anthropology in college and thought that I would use my legal education to work with Native American groups,” she shares. “But, in my third year of law school, we read about the Hunt brothers’ attempt to manipulate the silver market for personal gain, causing the price of silver to skyrocket. The anthropologist in me was fascinated by the idea that these arrogant people thought they were bigger than the market.” Schapiro was hooked and, soon after graduation, landed her first job in financial services regulation. Schapiro calls it a “gift” to work in the public interest realm. “I have spent most of my professional life in government public service and enjoy the opportunity to make a difference in people’s lives,” she says. “Our goal across all of public service is the same—to make people’s lives better. Of course, there are sacrifices you make financially and in terms of your privacy and time. Public service is all-consuming, but there are enormous rewards. The SEC serves American investors and, at the end of the day, the decisions we make are those in the interest of investors and market integrity, and that’s an enormous reward,” she says. Not many people can say they go to work every day with a bounce in their step and clicking their heels. 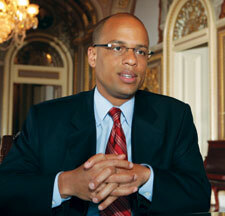 It’s the norm for Sudafi Henry, JD ’02, following his January appointment as director of legislative affairs for Vice President Joe Biden. Lauded by Biden as “a rising star on Capitol Hill,” Henry has served as a key congressional staffer for the past decade, most recently as counsel and senior policy adviser for House Majority Leader Steny Hoyer (D-Md.). Over the years, he has worked closely with and earned the trust of many members of Congress, acquiring strong policy experience and institutional knowledge along the way. A Los Angeles native, Henry landed his first position on Capitol Hill straight out of high school as an intern in the Senate Sergeant at Arms office. After earning his BA in history from the University of Maryland College Park in 1995, he served as legislative director for former Rep. Major Owens (D-N.Y.) for four years, leaving in 1999 to attend GW Law School. Following his graduation from GW Law and two years in private practice, Henry returned to Capitol Hill as legislative director for Rep. Emanuel Cleaver II (D-Mo.). He joined Hoyer’s staff in 2005, when Hoyer was minority whip, and experienced the congressman’s transition to House majority leader in November 2006 after the Democratic Party took back the majority. One of Henry’s most memorable experiences was traveling with Hoyer on a bipartisan trip to Darfur to assess the situation in the war-torn land. “It was a sobering experience that was impossible to prepare for mentally,” Henry says. “You could see the trauma in women’s and children’s eyes.” He also accompanied Hoyer to Germany to visit American troops who had been injured in Iraq and Afghanistan. “It was moving to meet with them and have the opportunity to thank them for their service and sacrifice,” he says. It’s a tough time for America’s workers as unemployment soars and benefits dwindle. On Jan. 20, the labor law community embraced Obama’s appointment of Wilma Liebman, JD ’74, as chairman of the National Labor Relations Board. First appointed to the independent federal agency in 1997 by Clinton and twice reappointed by George W. Bush, Liebman brings decades of experience to the job. As a newly minted GW Law graduate in 1974, she launched her career as an NLRB staff attorney in Washington and Oakland, Calif. She subsequently served as legal counsel for the International Brotherhood of Teamsters for nine years and the International Union of Bricklayers and Allied Craftsmen for three years. Prior to her appointment by Clinton to the NLRB, Liebman served as deputy director of the Federal Mediation and Conciliation Service. The George Washington University is an equal opportunity/affirmative action institution.